Happy Saturday everyone... This month instead of a new release we are sharing our Favorites with a Fun Blog Hop! 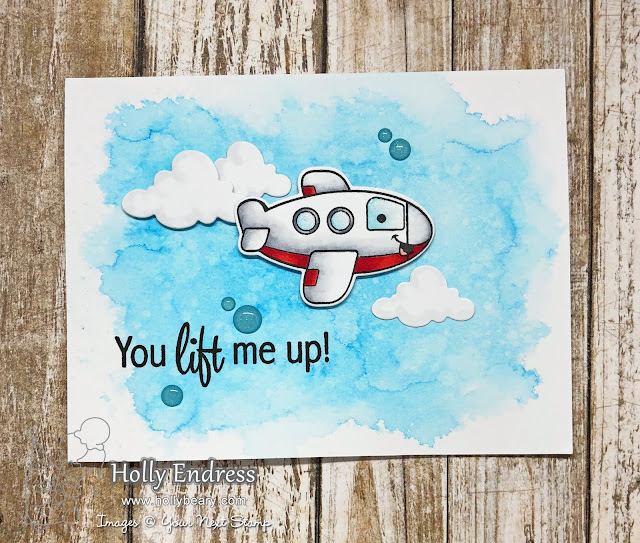 My card features the Just Plane Amazing Stamp set and coordinating die set. I created a distressed background on a piece of watercolor paper with some Salty Ocean Distress Ink. When it was dry I adhered it to a White card base. Then I stamped the sentiment in Black Olive ink along the lower edge. I stamped the plane image onto some White cardstock with the Black Olive ink and then I colored it in with Copics. I used the coordinating dies to cut the plane and some clouds out. I added a little color to the clouds with some Grey copics as well. I adhered the clouds and the plane to the background with some foam tape. I added some Spectrum Noir Sparkle Pen to the Windows of the plane. And for an extra pop of sparkle, I added some Enchanted Garden Sparkly Gumdrops. 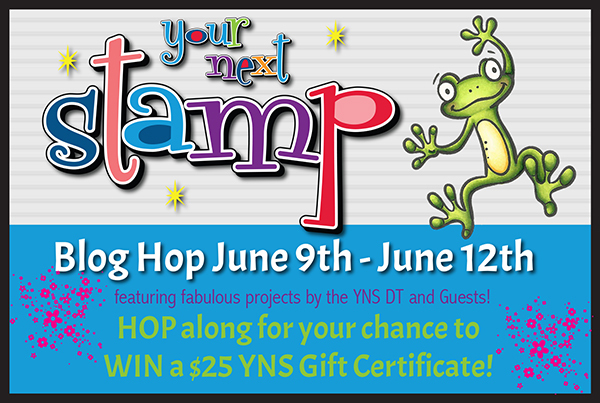 Are you ready to Hop along for a chance to Win a $25 GC to the YNS store? Too cute! Nice background too! So cool! Love your card! Great for any occasion and masculine cards too! Adorable card, Holly. The sky is perfection! This is amazing! I love the background and the clouds! SO COOL! I absolutely adore your background. That is such a cute card. Hi Holly, very cute card! Thanks for sharing! Love your card! The distressed sky is beautiful and the plane is simply adorable! Ohhh I LOVE this - your sky is fabulous!! I like this sweet, encouraging card! Beautiful card. Love your background ! Cute airplane and perfect sky. I love these type of cards that encourage you. Ypu always need them. The plane has a cute smile that will lift any spirits up. Graet card! 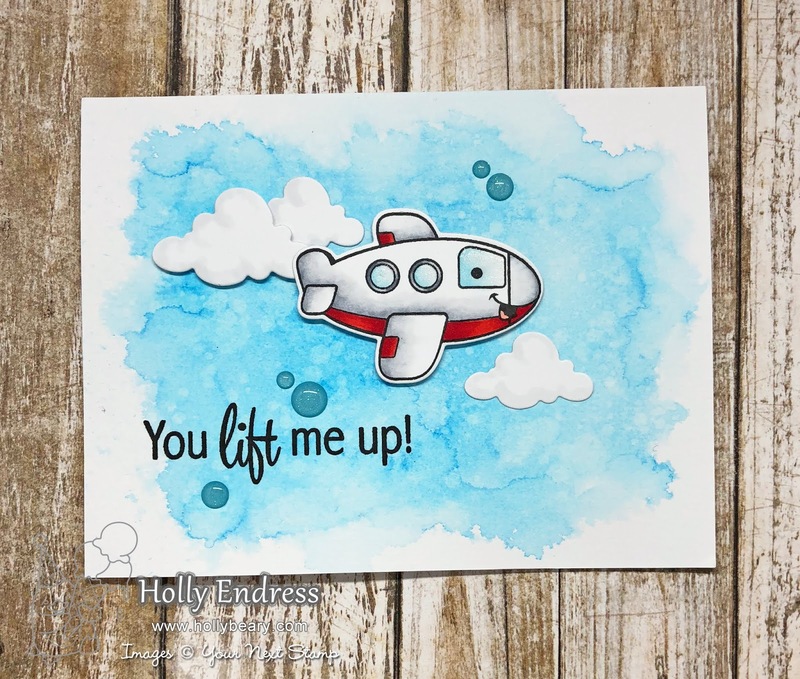 Such a fun card with a happy little airplane! Thanks for sharing. 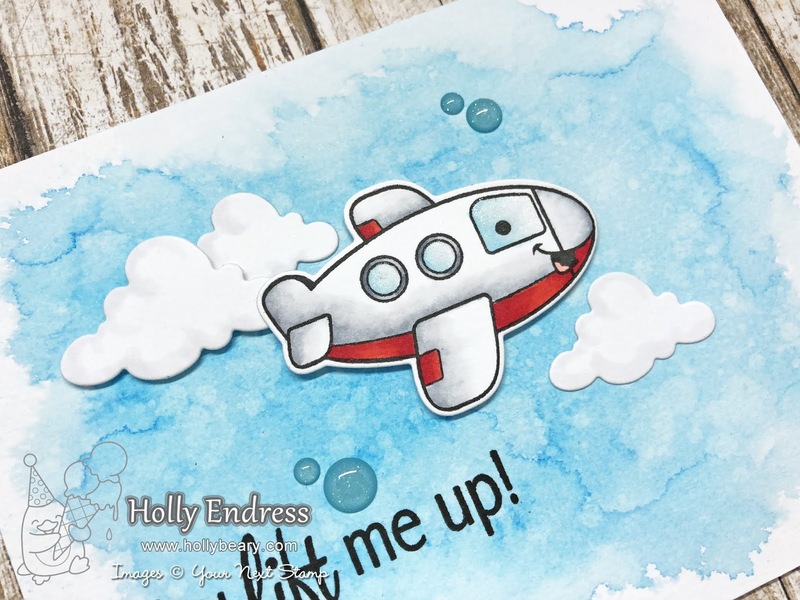 The distress ink base makes the perfect sky for this sweet plane! So cute, Holly. This is so cute! I love the background, and the plane is just adorable! Such a cute airplane and wonderful background. You colored that plane great and I love the water colored sky. what a great design and sky! This is a super cute card ! I love that chubby plane !